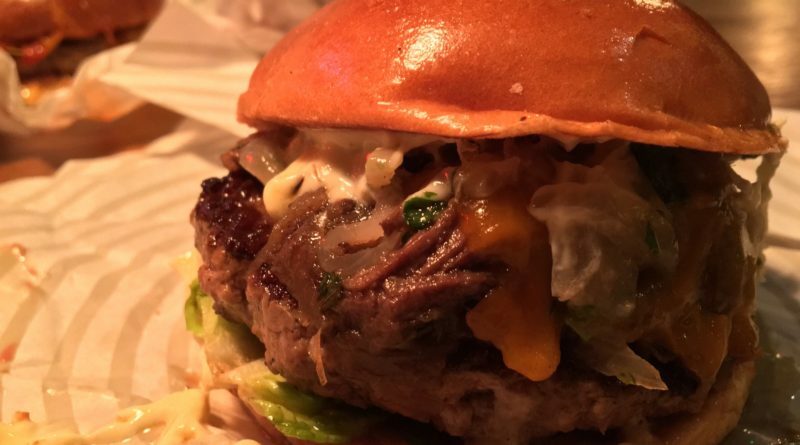 Aged Beef Patty, Mature Cheddar, Confit Shallots, Beef Shin Ragu, Lettuce, Truffle Mayo, Bacon & Parsley Relish, Brioche. I might be preaching to the choir here, but what I can tell you from the offset, is that Patty & Bun is extremely good! So good, that I am already feeling a slight bit of pressure to do justice to the Take It On The Shin monthly special in this review. 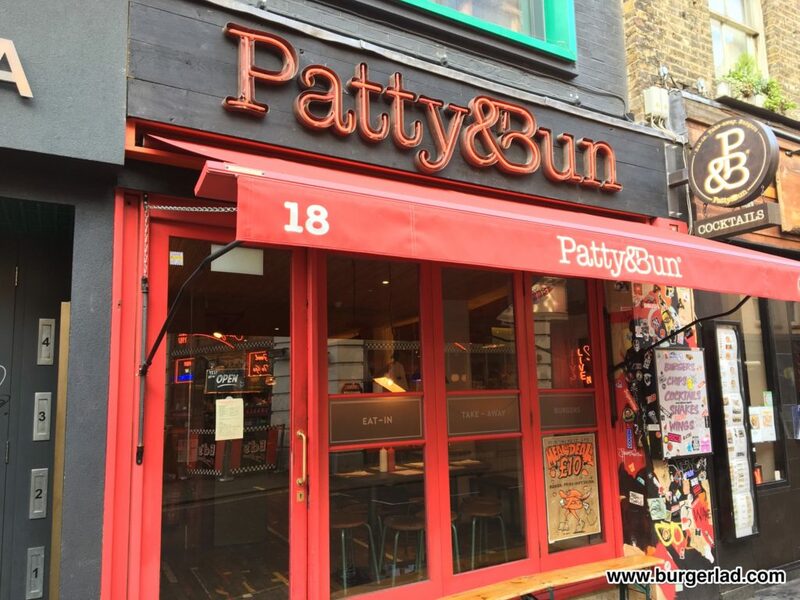 Patty & Bun started life as a pop-up concept, back in 2012 I believe, and has now become one of the premier burger destinations in the capital with seven locations. And it’s immensely popular. So much so, that if I was to use Treemapping to display the number of mentions and favourable comments I’ve seen about Patty & Bun, then the rectangle would certainly be one of the biggest on the visual. And they don’t take bookings… so be warned! We visited the Old Compton Street restaurant and a warm, friendly and funky welcome awaited us inside the stylish wood and exposed brickwork interior. It’s cosy and compact here, with roughly 30 covers upstairs and additional seating downstairs. The tables are basked in seductive red and warm spot lighting and the perfect lazy, laid-back tunes pump out of the sound system. Think funky, hip-hop, chilled beats. 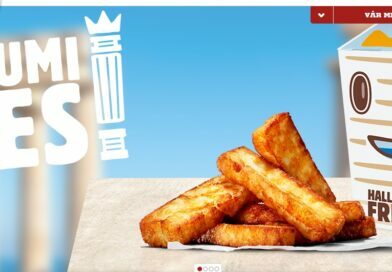 The menu is uncomplicated – it’s better to do a small number of things to this high standard, instead of having page after page of mediocrity. 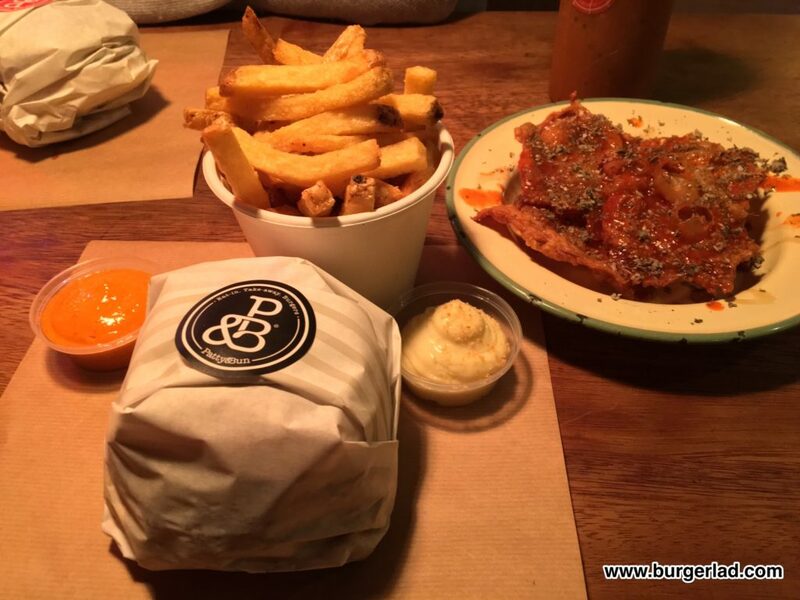 You’ve got the now famous ‘Ari Gold’ Cheeseburger – Admiral Burgerbar’s previous review here. 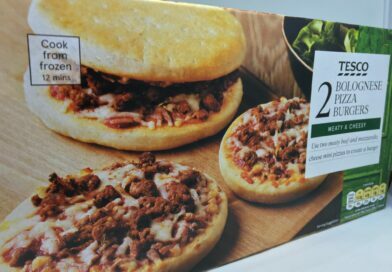 Alongside this, there are a few additional beef options, a revered lamb burger, chicken and the veggie option comes in the form of a braised field mushroom fritter. 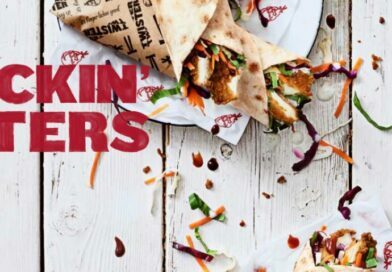 There’s also a tempting array of sides, such as the brilliantly named ‘Thunder Thighs’ or the Smoked Pork Nuggets with Jalapeno Ketchup. 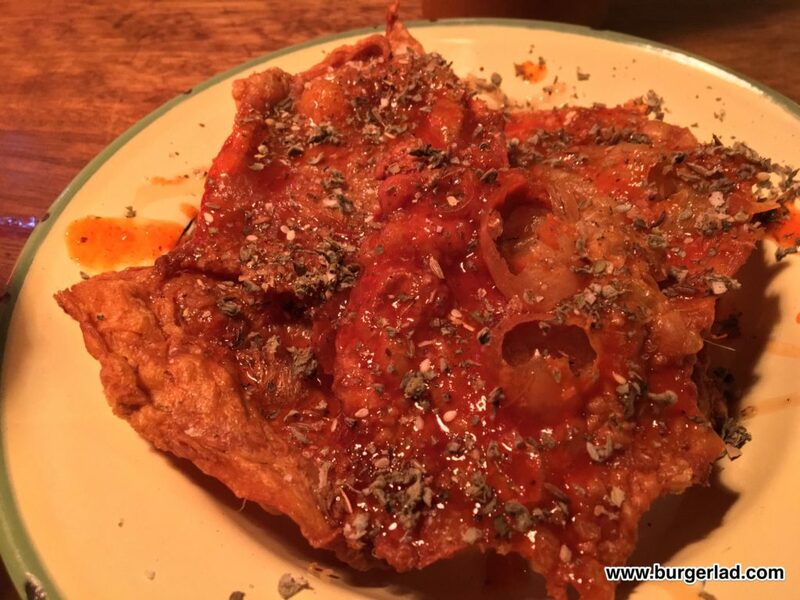 And special mention has to go to something I have obsessed over since departing Patty & Bun and London – their Roast Chicken Skin… which is an absolute must to try priced at £3. It’s naughty, addictively salty and one of the best and cleverest nibbles I have encountered on my burger journey. Think the thinnest and most delectable pork scratching you could imagine. Times this by 100 and you’re still not close to how good this is. The Take It On The Shin arrived in its precision-wrapping and looked like a birthday present I just had to open immediately! 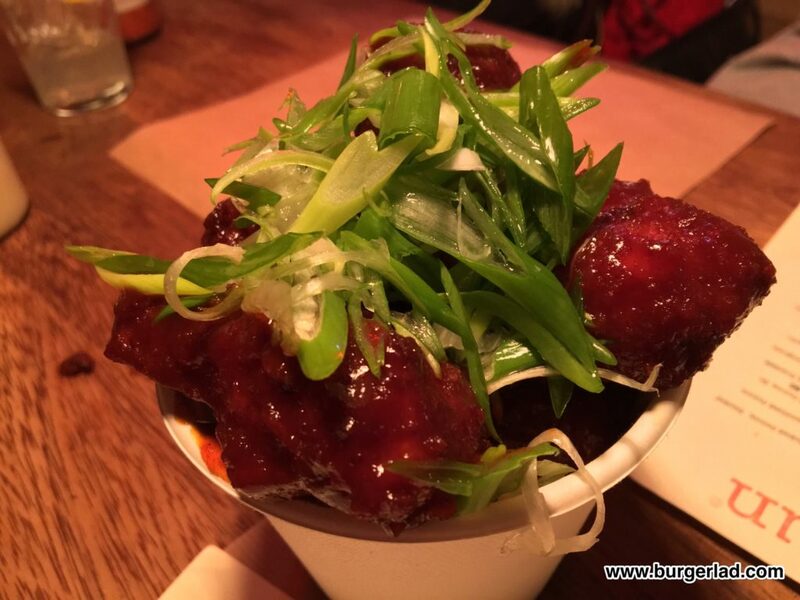 Prior to eating the burger we’d shared a portion of the ‘Winner Winner Chicken Dinner’ smoked confit wings with BBQ sauce and spring onions. These are very, very tasty and I was enamoured with their texture. Just the slightest crispiness to the coating, slathered in the subtle, yet glorious sauce which makes way for the best textured chicken wing I’ve ever had. They very much reminded me of thick glazed ribs, Chinese-style. And then doused in fresh, sharp Spring Onion shards = winner! But it is the burger you have to throw the most superlatives at! And this is a real treat. Biting in, you get hit with a taste and texture overload from the ingredients P&B use on the build. 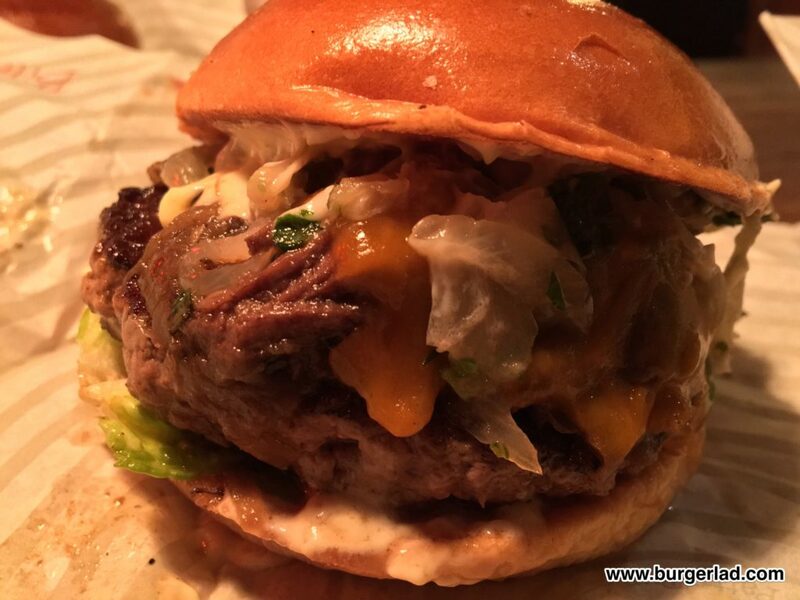 Your senses are flooded with waves of joy as you delve deeper into the complexity of this burger. It is bloody fantastic! Where do you even start to try and summarise something so brilliant!? The dry aged beef patty is certainly one of the best I have had. 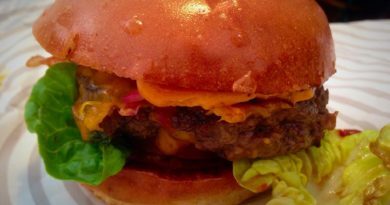 It’s got a perfect meat/fat ratio in the blend and your teeth literally just glide through to reveal the slightly pink interior inside (I’d asked for mine to be slightly over medium as the last time I was in London I had a very pink burger!). I can see what all the fuss is about though as it really is one of the very best I’ve sampled. Next up, you get the soft and rich beef shin ragu which is the perfect winter warmer for the cold and bleak January that this special is on. The ragu is a refreshing and innovative change to other, now commonplace meat toppings like brisket or pulled pork. It’s a very rich burger and that intensifies with each bite from the Truffle Mayo which gives you that umami component. It’s truly luxurious and indulgent and so delectable my words cannot give it justice – it’s that damn good! If that’s not rich enough for you, this is complimented by a clever arsenal of creamy Mature Cheddar, slightly sour Confit Shallots and the exquisite Bacon and Parsley relish – yeah you read that correctly! 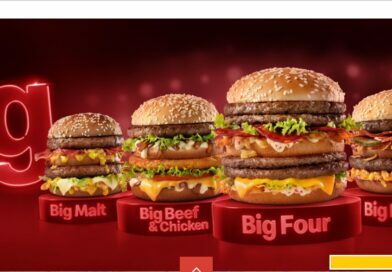 It’s the sort of burger I wouldn’t expect to see outside of major cities such as London or Manchester for at least another five years. Can this burger get any more decadent..!? It ticks every box imaginable. 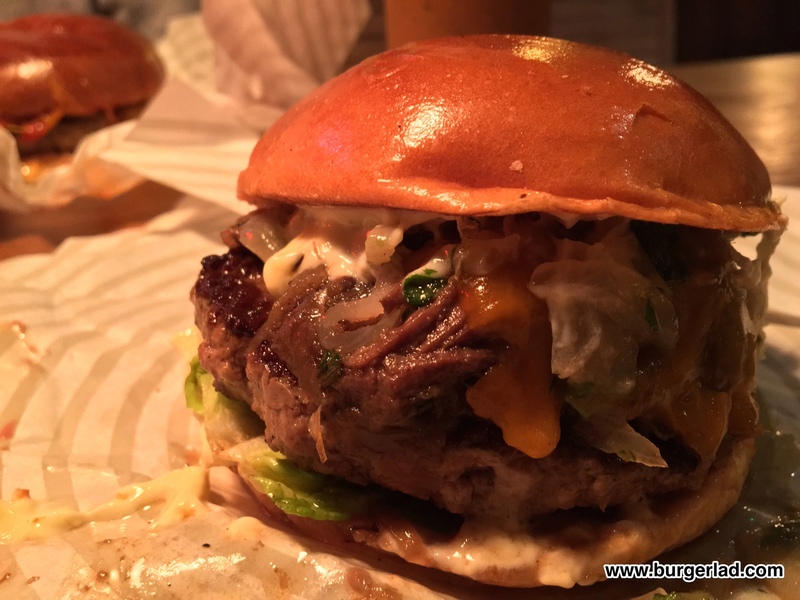 Re-reading this review as I type it, it’s very difficult to put into words just how great this burger and Patty & Bun is. The chips were brilliant with that chicken skin salt and roast chicken mayo. So addictive I actually contemplated ordering a second portion after we had finished. And the hot sauce… oh yes. Brilliant! In fact, they should bottle it and sell it as I would get it shipped to me, it was that tasty. And their pride and joy house mayo? I’m no mayo fan but this and the hot sauce is worth the entry alone! The front of house staff has to get a mention too. Very cool, very friendly and very passionate about their work and product, receiving the highest commendable praise possible. 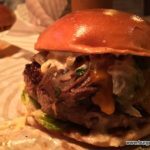 I have been invited to be one of the judges at the National Burger Awards in February this year. 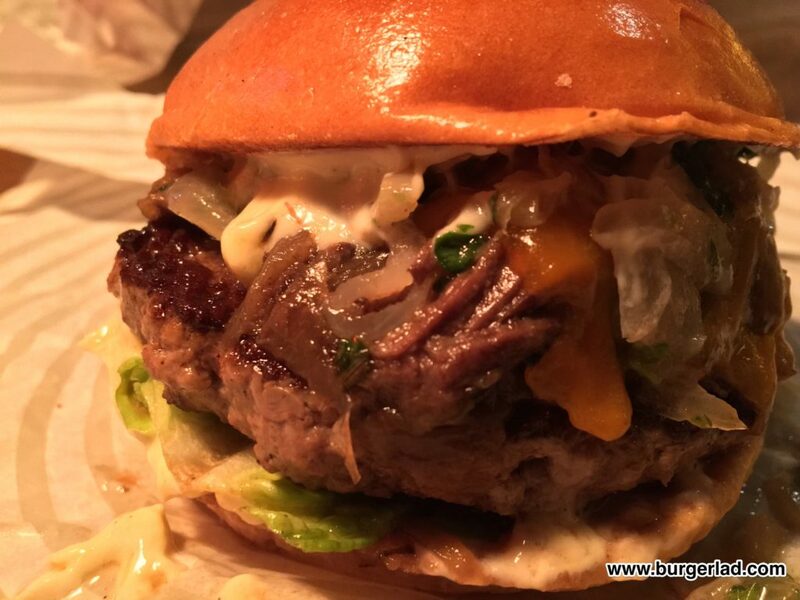 I can firmly state now, that this burger from Patty & Bun is certainly the standard by which all other burgers will be measured! 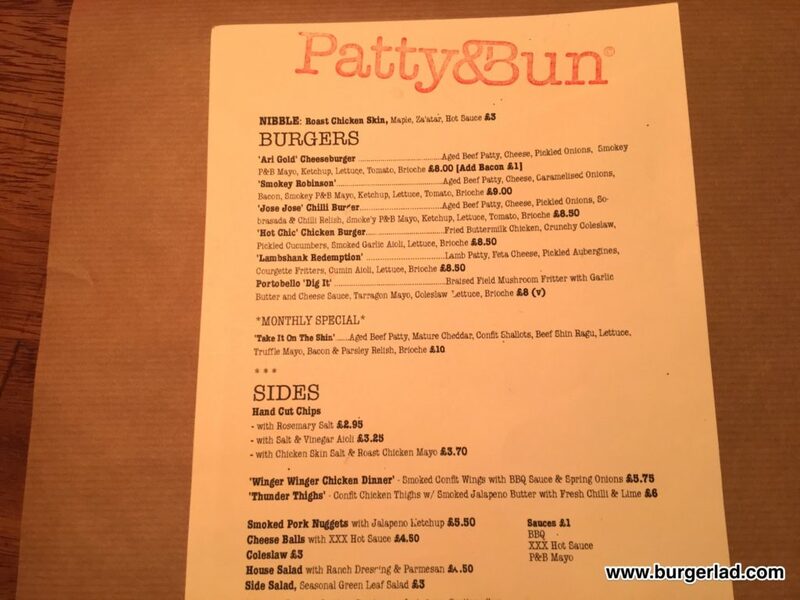 A big thank you to Miss Milkshake and the guys at Patty & Bun for arranging this special birthday surprise – exceptional food and a destination for the most serious of burger aficionados.